While it’s probably a bit of a stretch to assume, it’s at least a bit possible that the $22,000 Roger Corman had left over after completing production on The Young Racers significantly altered film history. When faced with the task of banking that money, using it to direct his own film, or handing it over to a young protégée working sound on The Young Racers, he went with the latter and tasked an unknown Francis Ford Coppola with crafting a quick and dirty Psycho riff with a small crew in Ireland. 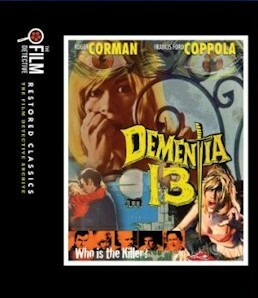 Obviously, one can argue that Coppola’s considerable talents would have eventually been noticed, but the film that became Dementia 13 is a more than interesting part of his origin story. If nothing else, it’s a film that’s more than just a footnote in the annals of Corman’s history of cheapie, off-the-cuff productions—not just a curiosity, Dementia 13 provides early evidence of a talent that would eventually blossom into a New Hollywood torchbearer a decade later. Not to get too caught up in the Emperor’s New Clothes and whatnot, but Coppola’s natural filmmaking ability is apparent right from the start. An evocative eeriness hangs over the opening scene, as a husband (Peter Read) and his wife (Luana Anders) float like a couple of luminous specters in a boat on an otherwise pitch-black lake haunted by the sounds of a Rockabilly tune. Poor John Haloran is furiously rowing away, much to the dismay of Louise, who’s dismayed about his heart condition; however, she’s even more dismayed that John’s mother has left all of her inheritance to charity, effectively cutting her out from the will. When John suddenly drops dead of a heart attack, that reality truly sets in. Faced with no other options, she dumps the body to the bottom of the lake and convinces his family that John is still very much alive on a business trip. Meanwhile, she hops a plane to Ireland, where she hopes to ingratiate herself to her dead husband’s family. It’s not hard to see the Hitchcock influence here: not only is a woman attempting to outrun her own misdeeds, but Anders plays the type of shifty blonde the Master of Suspense would have certainly appreciated. She draws you completely into her orbit as you watch her concoct an elaborate scheme in what is sure to be a low-key inheritance plot—and then an axe is shockingly, jarringly planted right into her face. While it doesn’t have the same effect as watching Marion Crane be swiftly butchered to death in the middle of Psycho, but it’s surprising and disorienting all the same. In fact, the hard left turn Dementia 13 takes a whole might be more disorienting, if only because the script is understandably slapdash, having been written in the span of about three weeks in order to quickly impress and convince Corman to invest in it. As such, the film takes on the tenor of an inheritance thriller, an old dark house mystery, and a slasher in the course of 75 hallucinatory minutes. To prop up his wobbly plot, Coppola leans on what would become an increasingly popular tactic of resorting to delirious imagery to create a psychotic, dreamlike sensation. A young girl’s long-dead body rests at the bottom of a pond, impossibly preserved; woozy flashbacks hint at a childhood trauma that continues to haunt; abandoned dolls float to the top of the water; perhaps most pressingly, a madman with an axe continues to stalk, occasionally emerging from the shadows to hack up unsuspecting victims. Coppola’s skill as a visual artist is apparent in the manner Dementia 13 rolls along like a haze, often despite a low-budget that demands nonsense expository scenes to bring some order to the chaos. Narratively, the film functions well enough—like any vaguely European hack-and-slash from this era, it makes the faintest bit of sense, hinging on buried secrets and hidden trauma. It’s very much a film you have to go with, and Coppola makes that easy enough by crafting a film that blends psychological intrigue, a gothic atmosphere, and a then-burgeoning splatter movement. Released in the shadow of Herschell Gordon Lewis’s seminal gore flick Blood Feast, Dementia 13 can’t claim to be an absolute landmark in that respect, but Coppola stages some positively messy, deranged bits that feel like a shock to the system, particularly when they’re couched within an otherwise vintage aesthetic. Like many films of this era, Dementia 13 is at a crossroads, caught between the genre’s gothic past and its more grisly future. Hitchcock, of course, practically carved out that particular crossroad with Psycho, yet Coppola’s effort is too uniquely delirious to dismiss as a simple knock-off, no matter what his marching orders from Corman were. One can make the argument that Dementia 13 feels more akin to the emerging krimi and gialli genres, and it’s endlessly fascinating that Francis Ford Coppola of all people was there to help bridge that gap. Fortunately, it makes for more than just a curiosity—Dementia 13 isn’t a mere anecdote or trivia factoid to remind people that Coppola once directed a shoe-string budget slasher at the behest of Roger Corman. Rather, it’s one of the first expressions of a major talent, one that would eventually help reshape Hollywood into a haven for talent throughout the 1970s. It’s almost ironic that his first official effort came under completely different circumstances: Corman would eventually bring in Jack Hill and Monte Hellman to shoot some additional material in order to fix an “unreleaseable” film, leaving Coppola at odds with the producer in post-production. That tension aside, however, Dementia 13 represents a feather in the cap of Corman, who would similarly cultivate talent for the next two decades, likely thanks to his ability to boast that he discovered Coppola. Not a bad deal for $22,000. For years, Dementia 13 was trapped in public domain purgatory. I have a very vivid memory of attempting to watch it for the first time over a decade ago, only to be thwarted by the fact that you literally could not see almost a damn thing. Other transfers proved to be less murky but only marginally more satisfactory, so The Film Detective’s new Blu-ray restoration personally presented the opportunity to watch the film for the first time proper. Compared to those previous dingy releases, this one is a revelation, even if it doesn’t present the sharpest details or the deepest black levels. Nobody will mistake it as a reference-quality disc, but it does restore this film to its rightful glory. It’s almost unfathomable that it was allowed to slip into the hellish landscape of budget pack releases, so it’s nice to see it rescued and given its proper due.